Сегодня не просто четверг: сегодня четвёртый четверг ноября, а следовательно - День Благодарения в США, где это - государственный праздник. День Благодарения отмечается с размахом и помпой. Но коренные жители Америки - "дикие" племена индейцев, которые приветливо встретили "цивилизованных" европейцев на своём континенте, в результате потеряли практически всё - миллионы были истреблены, земли отобраны, культура загублена, а современные американские школьники в своей основной массе не получают об этом ни малейшего предствавления... оно и понятно, ведь историю, как известно, пишут победители. Между тем, именно наивные и благодушные индейцы научили первых переселенцев выживать на новом континенте. Преступления белых чудовищны и бесчисленны, но об этом мы ещё успеем поговорить. А сегодня послушаем рассказ о празднике из уст потомков белых поселенцев в США. Thanksgiving is celebrated every year on the fourth Thursday of November. The month of November comes in autumn, the main season for harvesting crops. Thanksgiving is an autumn harvest festival like those found in many cultures. Today the holiday is a time of family reunions, parades and watching football games on television. And, oh, yes, food! For millions of Americans, Thanksgiving is a day spent cooking, eating and spending time together. The writer O. Henry called Thanksgiving the one holiday that is purely American. It is not a religious holiday. But it does have a spiritual meaning. Some Americans travel long distances to be with their families. They eat a large dinner, which is the main part of the celebration. For many people, Thanksgiving is the only time when all members of a family gather together. The holiday is a time of family and family reunions. The government says the Sunday after Thanksgiving is the busiest day of the year for long-distance travel. This is when people usually return from gatherings. But let’s get back to the food. The star of the Thanksgiving meal is the turkey! 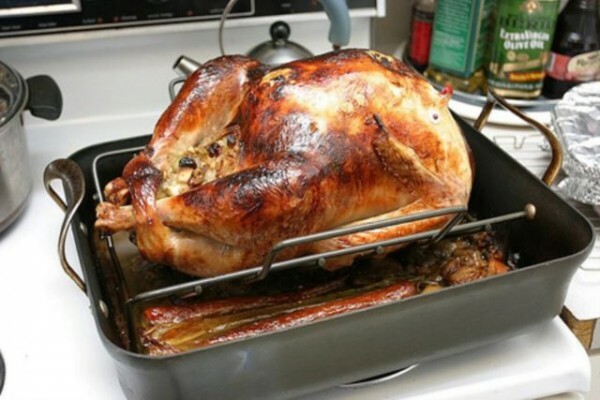 This large bird roasts in the oven all morning. The smell of celery, onion and herbs fill the house and makes everyone hungry. Two traditional side dishes are mashed potatoes and sweet potato casseroles. And there is another - stuffing - a bread-and-vegetable mixture that is literally stuffed into the turkey and then baked. While people cook the Thanksgiving meal and talk with family members and friends, others might be watching American football games on television. Over the years, Americans have added this tradition to their Thanksgiving celebrations. A number of football games are played on Thanksgiving Day. 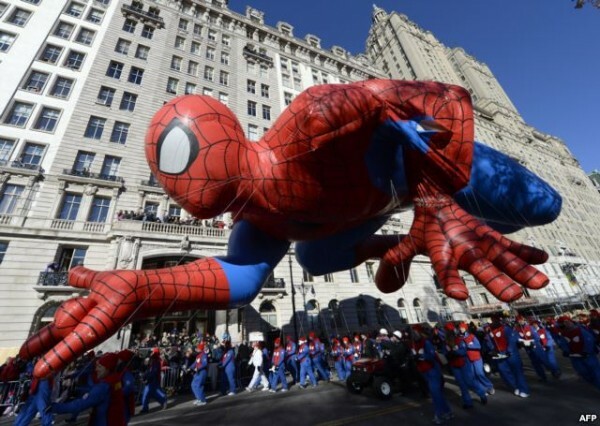 Another tradition is the television broadcast of Macy’s Thanksgiving Day Parade. The parade takes place every year in New York City. Employees of the Macy's store on Herald Square organized the first parade in 1924. Many of the workers were immigrants and wanted to hold a big parade like the ones in Old World Europe. So they dressed in special costumes and borrowed some animals from the zoo. They also carried small balloons that floated just overhead. And then sometime in the afternoon, the dinner table is set. It is time for what everyone has been waiting for. Dinner is served! Some families have more than one dinner table at Thanksgiving. Children may eat together at their own table. Usually, the people who are invited to dinner belong to the same family. But anyone can bring a friend. In fact, many Americans live far away from family members. So, getting together at Thanksgiving is not always possible. Many people in this situation have a dinner party and invite their friends who are also without family for the holidays. It is important to remember that the United States is home to many poor and homeless people. They cannot buy a Thanksgiving dinner or spend the holiday with friends and family. All across the country, religious and service organizations provide holiday meals for older adults, the homeless and the poor. 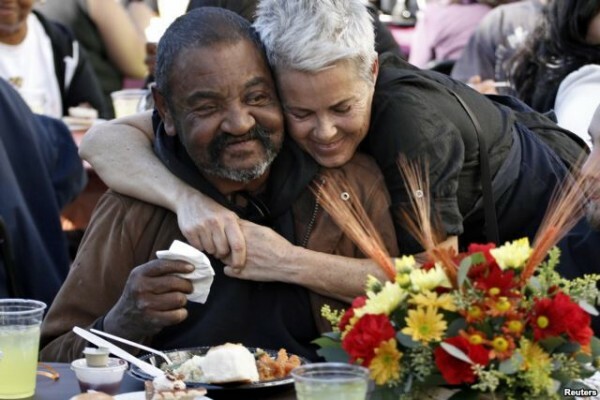 Whether you are eating with family and friends or serving meals to the homeless, Thanksgiving is a time to give thanks. Before the meal begins, it is traditional for everyone to say a few words about what they are most thankful for.